Britten Sinfonia Academy are about to embark on their first course of the 2017-18 season and what a season it promises to be for the talented young musicians of our youth ensemble. Now entering its sixth year BSA is the foremost chamber orchestral training opportunity for bright young talent from the east of England. Members have the chance to work with internationally acclaimed guest artists, commission new work, perform alongside their professional colleagues and take up the challenge as inspirational role-models to other young musicians. Saturday 2 December 2017 – BSA give a free festive performance in the Barbican foyer, ahead of Britten Sinfonia’s performance of Chichester Psalms that evening. 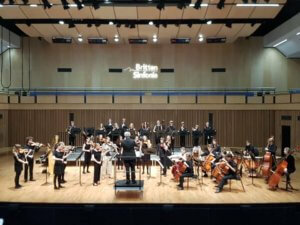 The BSA composer hub aims to support talented young composers aged 11-18 from the East of England. We aim to develop their creative, technical and stylistic skills through a programme of tailored compositional briefs, mentoring, rehearsals and public performance opportunities. This year the hub is led by professional composer Tom Coult, who will mentor the four students across the year and attend one day of each of the six orchestral courses.